BEING a fallera is more than just putting on a posh frock and it’s certainly not to be referred to as ‘fancy dress’. The cost of the dress alone is enough to make one weep, then there are all the extras; the hair, the jewels, the underwear, not to mention the annual fee paid to be a member of one of Valencia’s 355 Fallas (a sort of cliquey club or association). Each Falla has a fallera mayor, if you like the Miss of their group. This is quite an honour but also a huge expense for the family, around €30,000. 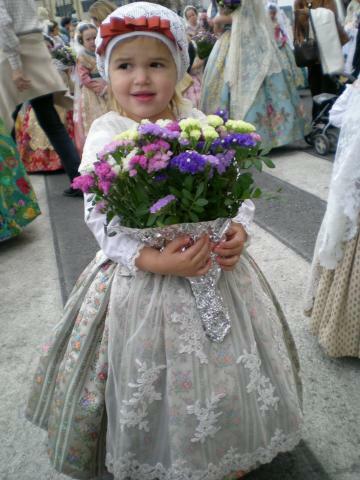 There is also a fallera mayor infantil for girls up to the age of about 13. The fallera mayors can then put themselves forward to be fallera mayor of Valencia. This can cost around €60,000 for the family. The expenses include at least four or five pure silk outfits and the cost of entertaining; breakfast, aperatives and coffee for the whole court d’honor (the twelve falleras who go with the fallera mayor, rather like ladies in waiting), presents for the members, lunches and dinners, fresh flowers in the fallera’s home every day and a maid employed around the clock to keep the house tidy. I’ve even heard horror stories of families having to sell homes and businesses at the end of their daughters’ year as fallera mayor. Let’s start with the dress, although strictly speaking it’s actually a falda, skirt, and corpiño, bodice together, sometimes of the same fabric, sometimes different. You’ll be lucky to buy the two for less than €1,200 and for pure silk expect to pay upwards of €6,000. Each fallera ‘dress’ is tailor-made as are the shoes of the same fabric. The rule here is that if the bodice is different from the skirt the shoes should match the bodice. Given the cost of outfitting one’s daughters in fallera dresses you might think that once bought the dress would serve for several years, but you’d be wrong. Believe it or not the fashions of this ‘traditional’ dress change; a few years ago the trend was for mid-calf length hems, now the skirts have to almost touch the ground. Likewise the manteleta, the lace shawl, which once reached right across the shoulders is now smaller, while the delantal, the lace apron, once finished above knee height and now reaches to the hem of the skirt. 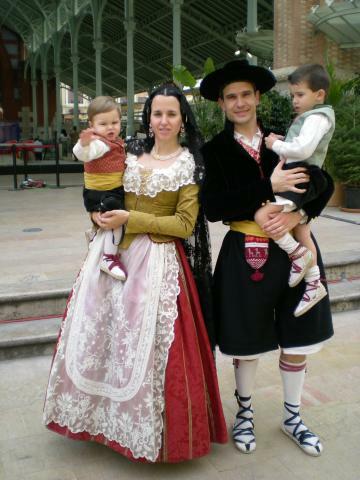 The sleeve styles and bodices have also changed and some Valencians complain that the current styles are more akin to something that would have been worn at the court of Marie Antoinette, rather than sported by a Valencian peasant woman working in the rice fields. A cynic might say that the fabric manufacturers and Fallera shops instigate these fashions to keep themselves in business. Whatever the cost, a fully dressed and groomed fallera is a sight to behold. This brings us to the hair, not a quick affair either. The fallera’s own hair is gelled to her head and parted in the centre and down the sides, then a bun is made at the back around which is woven the plaits of bought hair. This has to be real and of the same shade as the fallera’s own locks. At the side is more hair, twisted in circles, à la Princess Leah in Star Wars, is placed over the ears, rendering the fallera unable to hear clearly or speak easily on her mobile phone. These added pieces of hair are known as moños. On top of all this hair three gold combs are added and then the jewellery which consists of a coordinated necklace, large earrings and a broach or cholla. With so many adornments it’s not unusual for the falleras to get a headache, and having a comfortable siesta is not an option once the hair is done. Usually mothers, sisters or aunts arrange the falleras’ hair, but many go to the hairdressers and have it put up professionally at a cost of around €40. Rather than go to the hairdresser’s every day, once put up they might decide to keep the hair arranged for the duration of the festival. The process is easily comparable to dressing for a wedding and once the hair is done the fallera has to be helped into her clothes so as not to mess up her hair. First the layers of petticoats, with the hidden mobile phone or cigarette pocket and then the main ooutfit itself. All this said I can’t wait till next year when I’ve been promised I’ll be able to dress up, I mean dress as a fallera. Fallas are the beautiful wood and papier mache sculptures displayed throughout the streets of Valencia in the week leading up to 19 March, San José and Spain’s Fathers’ Day. Then, on the night of 19 March all the fallas are burnt amid much noise and fireworks. Each sculpture is provided (ie paid for) by a group of people, also known as the falla. 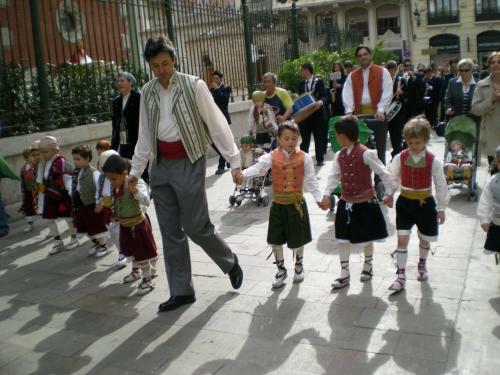 Men belonging to this group who put on traditional dress for the festivities are known as falleros and the women, falleras. Normally residents belong to the falla closest to their home or their parents’ home. Large marquees or carpas are put up close to the falla and this is where all the social activities take place. Judges visit the fallas and vote on the best and for the past few years the award for primera falla has gone to Nou Campanar which has boasted ever larger displays at an ever escalating cost. Last year (2006) it was estimated that €600,000 was spent constructing the magnificent Asia-themed falla it’s not surprising metro trains and buses were packed with visitors all wanting to pay €4 and catch a glimpse of it before it went up in smoke on the last day of the festival. The end of Las Fallas is marked by the burning of all the falla sculptures on 19 March, San José (the Spanish father’s day). Valencia is famed for its oranges and rice, both imports from China. But the other big import from our Asian friends was fireworks. If you are of a nervous disposition or are easily startled by loud bangs then this is not the city for you as fireworks can be heard throughout the city, day and night. Mascletá – held daily at 2pm in Plaza del Ayuntamiento, this is a total body experience as far as a fireworks display can be. The emphasis here is on noise. Get there early (1pm/1.30pm) or you won’t be able to get into the square. Smaller mascletás are held around the city. Castillos – nightly fireworks display in the ‘river’, now a park. La crema – last night when all the fallas are burnt. 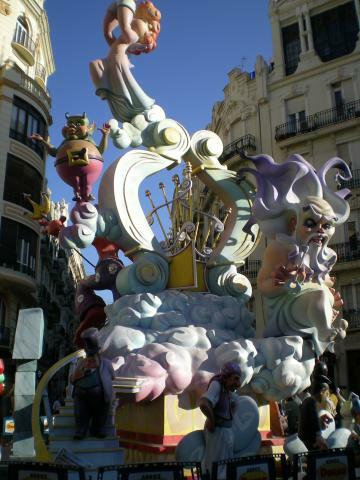 La ofrenda de flores – this is when the fallas groups process to the cathedral and give flowers to the virgin. An emotional time for many. La virgen – the statue of the Virgin of the unsheltered (patron of Valencia) is brought out of the cathedral and decorated with flowers. Carpas – marquee at each falla where social events take place.